Join me on my journey and quest for a vibrant, healthy life! Cholesterols – good or bad? Part 2 – What does it mean? You’ve probably heard about good and bad cholesterol. Maybe from your doctor, when reading articles or on TV. But there is really nothing good or bad about them, they just have different roles in the body and without them we could not get fat, used as energy, and building blocks, like cholesterol, to our cells. When measuring cholesterol in the blood we usually measure their transportation devices. Since fat, some vitamins and cholesterol cannot be solved or only be solved in small amounts in the blood, they need to have a vehicle to travel in to get out to the tissues. These are made in the liver and are called lipoproteins. They are little bubbles of fat, with an outward layer consisting of phospholipids, which have water-soluble heads consisting of proteins that are pointing outwards, and fat-soluble tails that are pointing inwards. In the middle cholesterol, triglycerides and antioxidants like vitamin E are carried. Each of these little packages are tagged with a special protein, just like the tag you get on your luggage when you check in for a flight. All the personnel on the airport and at every place you stop will know it’s destination. The cells in the body can identify the particle in just the same way. The lipoproteins are named according to their weight and densit y. 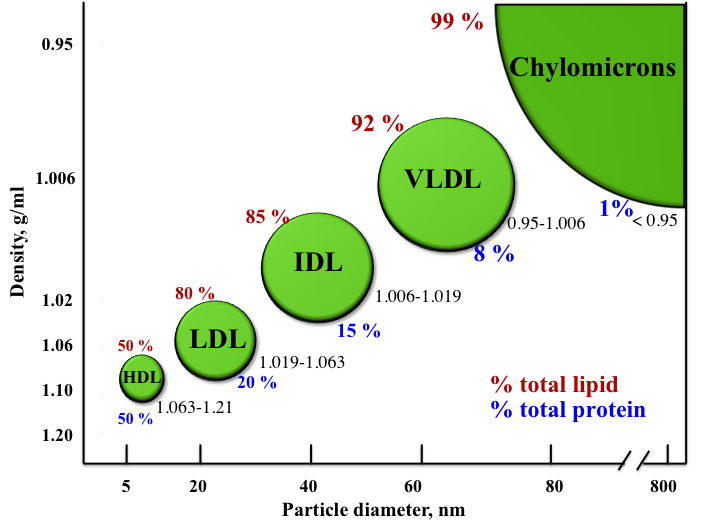 So the biggest and least dense of them are called VLDL (Very Low Density Lipoprotein), the next one LDL (Low Density Lipoproteins), IDL (Intermediate Density Lipoproteins) and the smallest and densest ones are HDL (High Density Lipoproteins). On the diagram to the right there is also a big molecule in the right upper corner, called a chylomicron. It carries fats and cholesterols from the intestines through the lymph to the blood and deliver some of its contents to mainly muscle and fat cells on its way to the liver. The lipoproteins that are measured in the lab and talked about when you go to the doctor is mainly LDL and HDL. LDL transports the fat, cholesterol and other particles within it to the various cells of the body and make it possible for the muscle cells to use the triglycerides for energy and to deliver cholesterol to the various sites where it’s needed. This one has been called “bad” because it has been found in its oxidized form in the lesions seen in the vessel walls of the victims of heart attacks. HDL brings back cholesterol and remnant fats to the liver, to be recycled into new LDL particles or excreted. It can pick up cholesterol from tissues on it’s way to the liver and was named “good” because it can take up cholesterol from the damaged vessel walls. The truth is they have no intrinsic good or bad activity, the just fulfill their functions, to safely transport cholesterol and fats around the body. The question that should be asked is why the LDL end up in the vessel walls and what makes them oxidize and become potentially dangerous? Previous postCholesterol – good or bad? Next postInsulin – the key to the sugar door. Low Carbohydrate Diet Might Be Better for Losing Weight and Improving Heart Health. Ketogenic diet – a remedy for Diabetes? Your Invisible Friends – The Gut Bacteria.